"When I look into Edna's eyes, there is someone looking back at me." 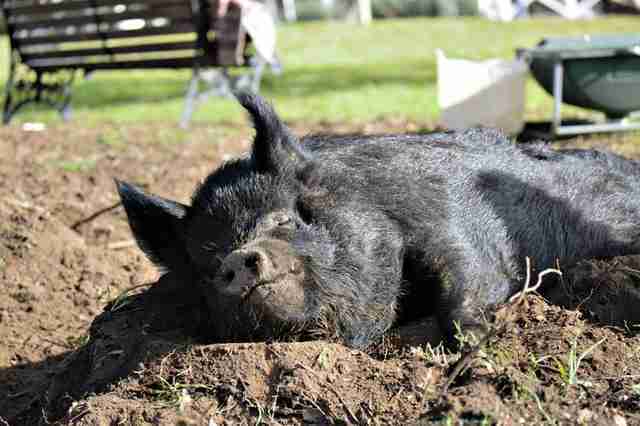 Edna the pig came from such severe neglect it's a wonder she's still alive. 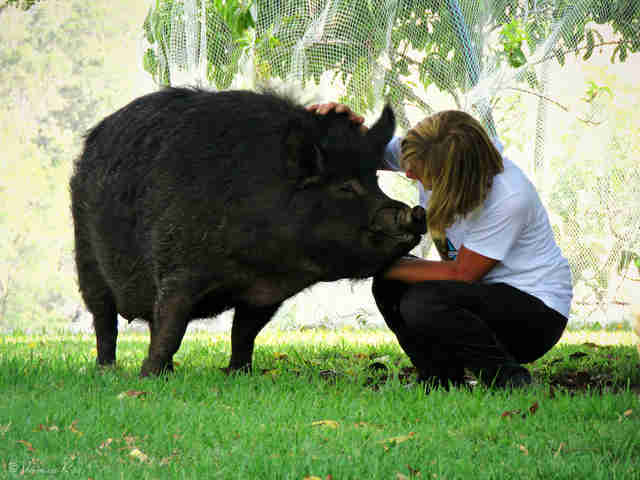 For more than 12 years, Edna lived in a small pen with her sister at a private residence in Australia, according to Deborah Pearce, founder of Where Pigs Fly, the sanctuary where Edna eventually ended up. Edna and her sister used to have a backyard to roam in, but when the fencing broke, the owners kept them cooped up in the pen. "The pen was muddy," Pearce told The Dodo. "Even after a short burst of rain, the dirt floor would pool water for days and days. This was an ongoing issue - every time it would shower, it would pool. Due to confinement, her leg muscles were weak and it would hurt for her to stand." 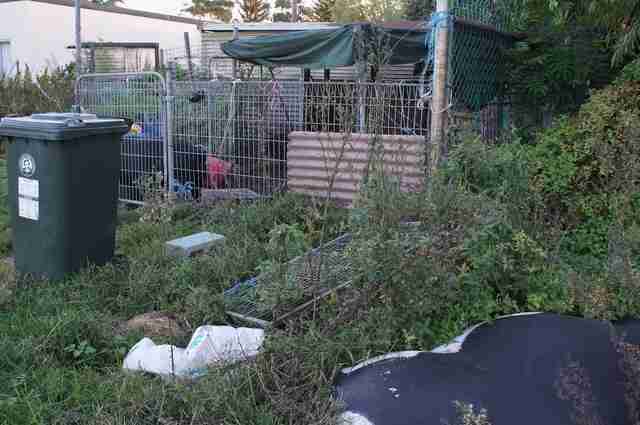 When her owners decided to move away, they decided not to take Edna and her sister. 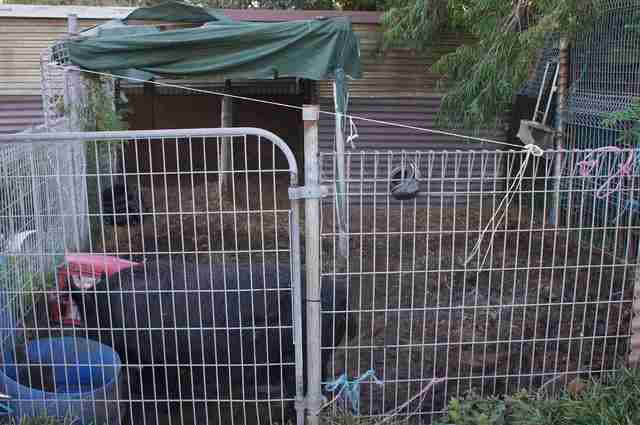 They didn't even try to get another family to adopt the pigs - they just left them in the pen. "They did not want them any more," Pearce said. 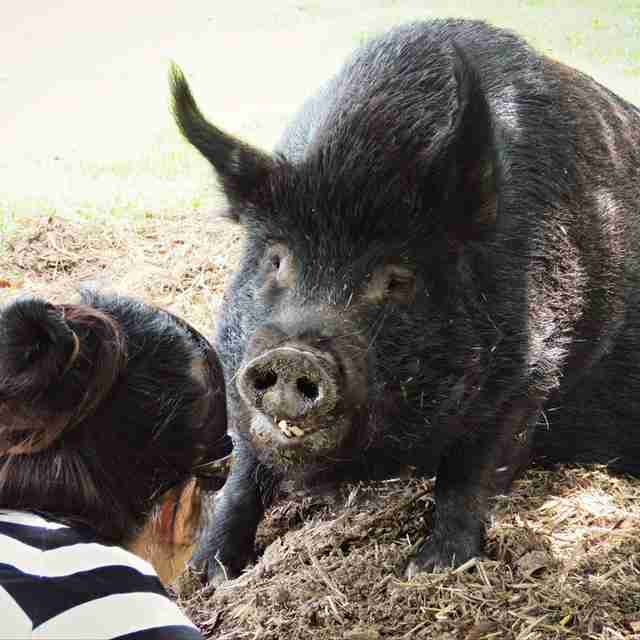 "The family went interstate and left the pigs behind." Then the worst happened - Edna's sister died because she wasn't getting enough food or water. 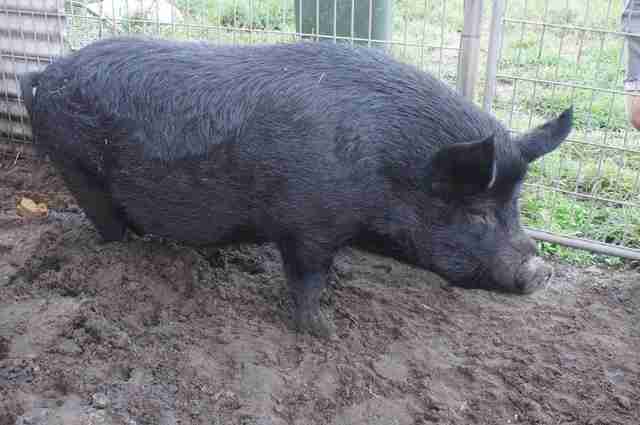 Edna was now alone in the pen, and she stayed like that for about six months, Pearce said. 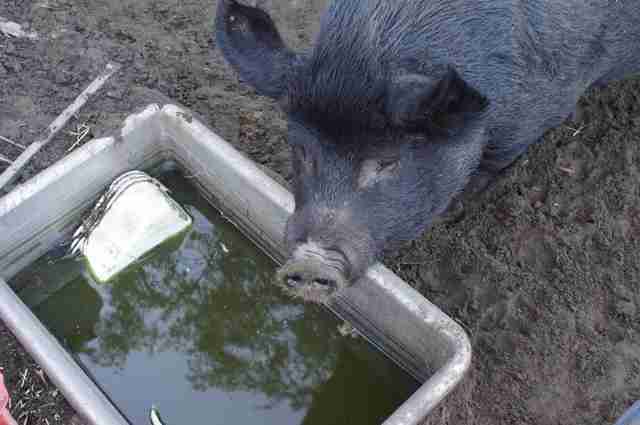 The neighbors fed Edna fresh fruit and vegetables whenever they could, and they even cleaned her pen. But they knew Edna needed to get out - and get out quickly - if she was going to survive. 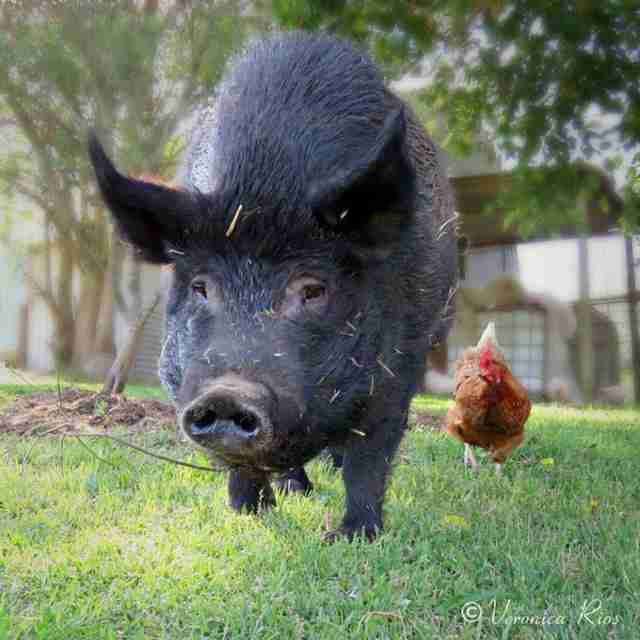 They contacted Pearce and asked if they could bring Edna to the sanctuary. Of course Pearce said, "Yes." Edna is now 13 years old. 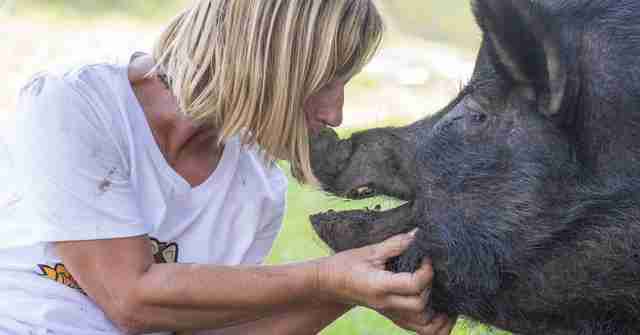 Having lived in such deplorable conditions, she took a while to adjust to her newfound freedom at the sanctuary. "She was emotionally shut down when she first arrived," Pearce explained. "She dug a hole and rarely moved for weeks. She was scared." Little by little, Edna emerged from her shell. "She became more curious and less scared," Pearce said. "She would venture further around the paddock. 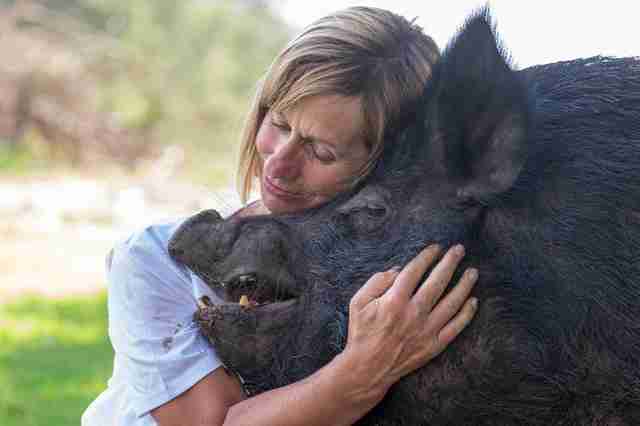 We spent a lot of time with her helping her recover." The most amazing thing to Pearce is that Edna still loves people, despite everything she's been through. "She smiles a great deal," Pearce said. "We spend a lot of time with her sitting and talking with her and giving her hugs. 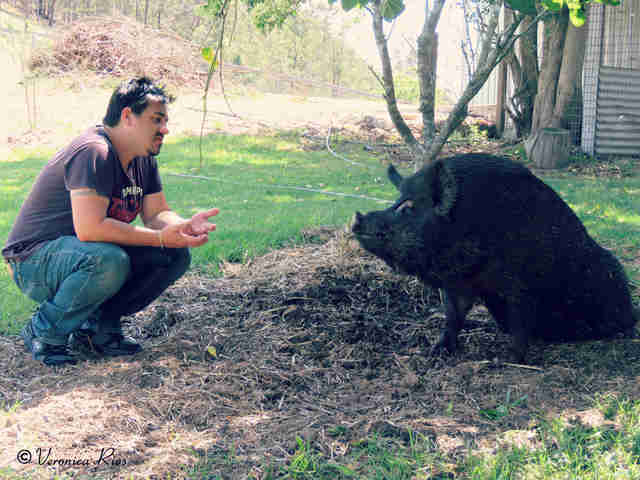 Her snorts and grunts of contentment are some of our favorite sounds at the sanctuary." "Her favorite activities are spending time with her human and animal friends she has made," Pearce added. 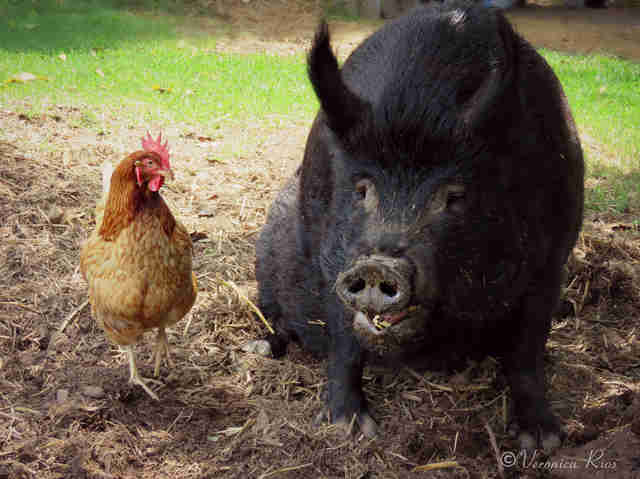 "One hen in particular is a good mate. She loves watermelon and pears and being sprayed with the hose." Now Pearce couldn't imagine life without Edna. In fact, she thinks of Edna as one of her best friends. "When I look into Edna's eyes, there is someone looking back at me," Pearce said. "We have a very close bond. Such a wonderful, gentle soul - her expressions of contentment and joy are incredibly infectious. She has put her terrible past well and truly behind her now, and she is loving her new life. Her transformation has been such a joy to have witnessed - one I will never forget." 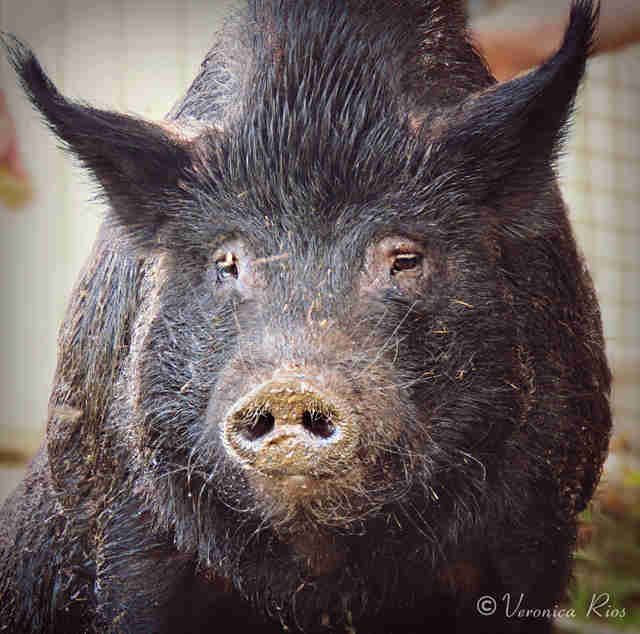 To help give Edna the best retirement, and help Where Pigs Fly rescue more farm animals from neglectful situations, you can make a donation here.